Come join America's Boating Club Houston for an amazing adventure in one of the most beautiful places on earth! Tropical beaches, breezes, and beverages await you in this sailor's paradise. Here's a nice promotional video from the British Virgin Islands, created since last year's hurricanes. 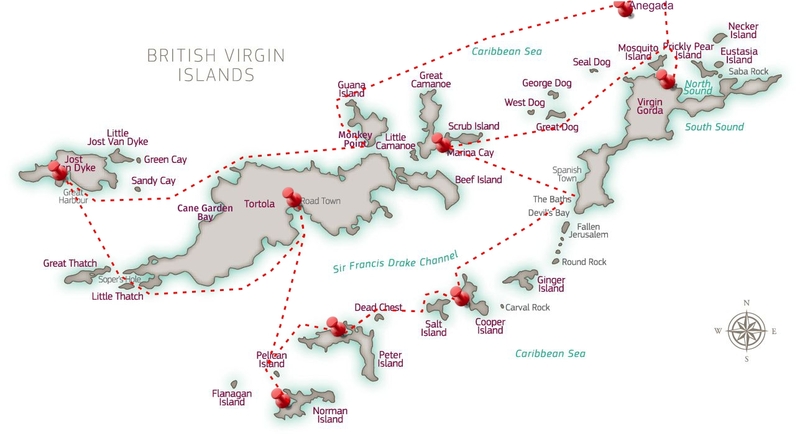 The British Virgin Islands (BVI) is a beautiful grouping of mostly volcanically formed islands that make up part of the border between the Caribbean Sea and the Atlantic Ocean. The islands range from quite large to tiny, and most have natural harbors that are perfect for sailors to island hop. The crystal clear blue waters draw all types of travelers and the friendly locals warmly welcome new and old friends. This is a bucket list trip you don't want to miss! America's Boating Club Houston is planning to charter a flotilla of sailboats from BVI Yacht Charters, located in Road Town on the island of Tortola. They have a wide range of sailboats for charter, from small monohulls to large catamarans. We hope to have enough qualified skippers and other participants to charter at least two boats, so some folks can go scuba diving while others sail, snorkel, fish, explore the islands, or just chill onboard. Hurricanes Maria and Irma decimated the BVI in 2017. Many charter boats were destroyed and left piled on one another. Charter companies have since purchased many mostly new vessels to complete their fleets. The boats are new, beautiful, and expensive. Charter companies in the BVI start their lowest priced season on July 10. Due to last year's hurricanes, they are no longer chartering vessels between August 1 and October 15. So, we expect to plan our trip to fall between July 10 and August 1. The actual dates of departure / arrival have yet to be determined. We do have some experience with this type of trip, including one to the BVI, so we believe we can safely estimate a range of costs per person between $1,500 and $1,700, based on which vessels are chartered and how much we fill each vessel. This base cost covers flight, charter, food, taxis, hotel stay, tips, some restaurant visits, mooring fees, taxes, etc. - everything except special activities (like scuba diving), alcoholic beverages, souvenirs, or other such extra luxuries on the trip. This is NOT a luxury vacation! You will not be waited on, and you will be expected to perform duties on this amazing adventure. Duties will include meal prep and cleanup and various daily planning and boat handling jobs. Now, if we have enough interest in such a trip, they DO offer captained charters. The captains cost an additional $175 per day, and you are expected to feed them, provide them a cabin, and tips are encouraged. I would expect the per-person cost addition for a captained trip to be around $400, which would mean the base estimate would jump to $1,900 to $2,100 per person. This is not including any other deckhands or chef, etc. Got a group and a qualified skipper already, but would like to go with a larger group with experience doing this sort of thing? Great! Sign up, and we'll help you plan and you can cruise with us! We are in the early planning stages for this trip. At this point, we ask that you fill out this survey if you are interested. We hope to use this to determine the size of the group, how many / what vessels we can charter, and who can help fill various roles on the trip. We are happy to have whole families sign up, but will likely ask that the minimum age be around 12-14. Also, you must be a member of United States Power Squadrons to go. Here's a promotional flyer with some pretty pictures! Share with your friends. This page will be updated as more decisions are made and details emerge.